Its Monday again! And time for a brand new post! Today I will be reviewing a body scrub that am currently using. Its the Spa Ceylon Luxury Ayurveda Forest Trail Body Scrub. I have used quite a few products from Spa Ceylon and loved all of them. You can check out my reviews on Spa Ceylon White Jasmine Facial Kit, Spa Ceylon Tea & Ylang Hand and Body Lotion and Spa Ceylon Ginger Spice Shower Gel by clicking on the above links. Their products have very unique, amazing scents. So let’s see how Spa Ceylon Luxury Ayurveda Forest Trail Body Scrub fares on me? 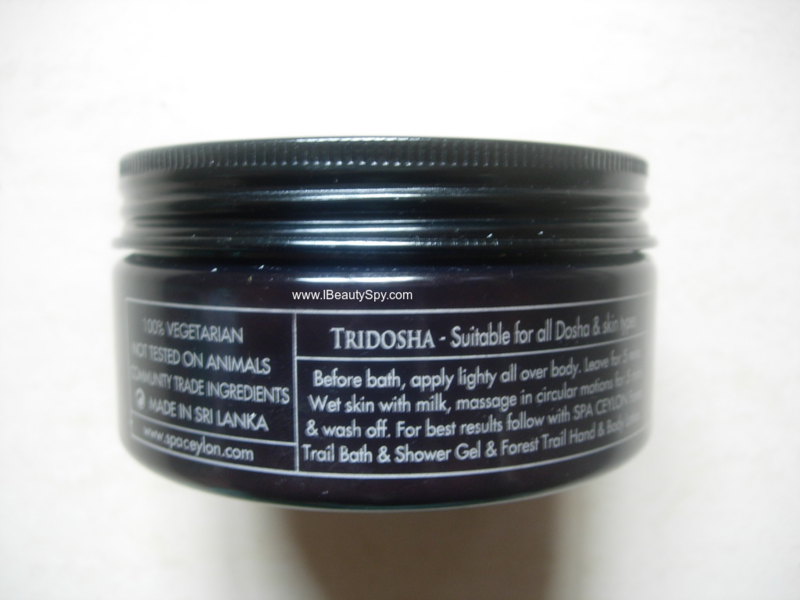 TRIDOSHA – A creamy formula enriched with exfoliating herbs & fragrant essential oils inspired by the forest habitat of the Majestic Ceylon Elephant. Organic Lemongrass, Eucalyptus & Patchouli help take away stress. Pure Peppermint cools hands & body while spearmint promotes a sense of joy. Cedar wood, Vetiver & Cardamom help uplift, refresh & invigorate. Deep-acting Margosa, Indian Gooseberry & Walnut combine to help purify skin, clearing clogged pores, removing toxins & dead cells. 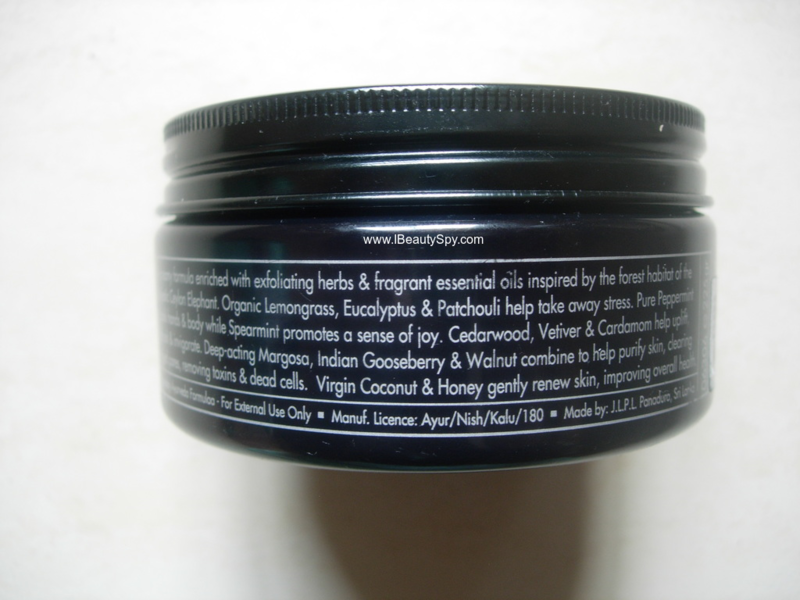 Virgin Coconut & Honey gently renew skin, improving overall health. As I have already mentioned in my previous reviews, the packaging of Spa Ceylon products is very simple. Since they are a luxury brand, I wish they improve the packaging to give a more luxurious feel to the product. Spa Ceylon Luxury Ayurveda Forest Trail Body Scrub comes in a simple black tub with a foil inside to prevent spillage of the product. Spa Ceylon Luxury Ayurveda Forest Trail Body Scrub is muddy brown colored and has tiny black particles in a cream base. The scent is amazing. Full of ayurvedic herbs and essential oils. It will leave your bathroom smelling so fresh and wonderful for hours. True to the name, the scent feels like you stepped into a forest full of natural herbs. 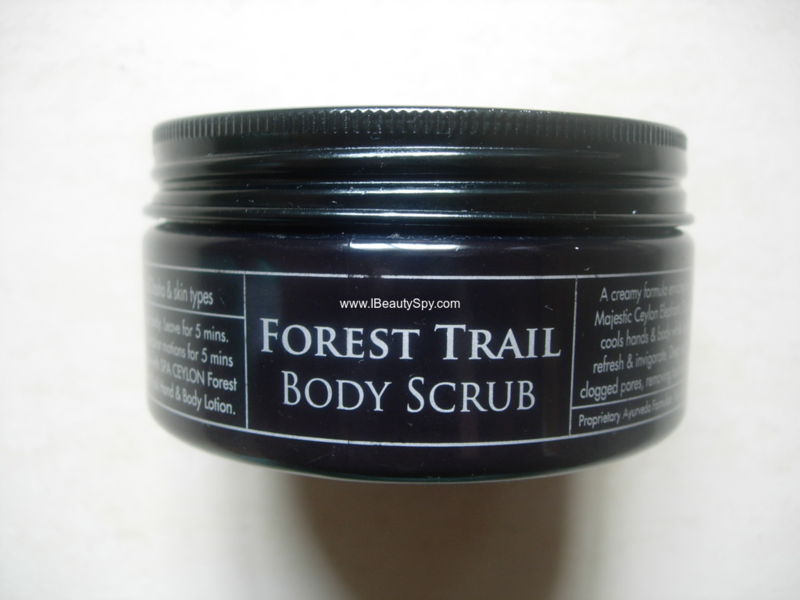 Spa Ceylon Luxury Ayurveda Forest Trail Body Scrub is a heavy duty deep cleansing, detoxifying scrub. Though it comes in a cream base, it does not feel very creamy unlike other cream body scrubs. 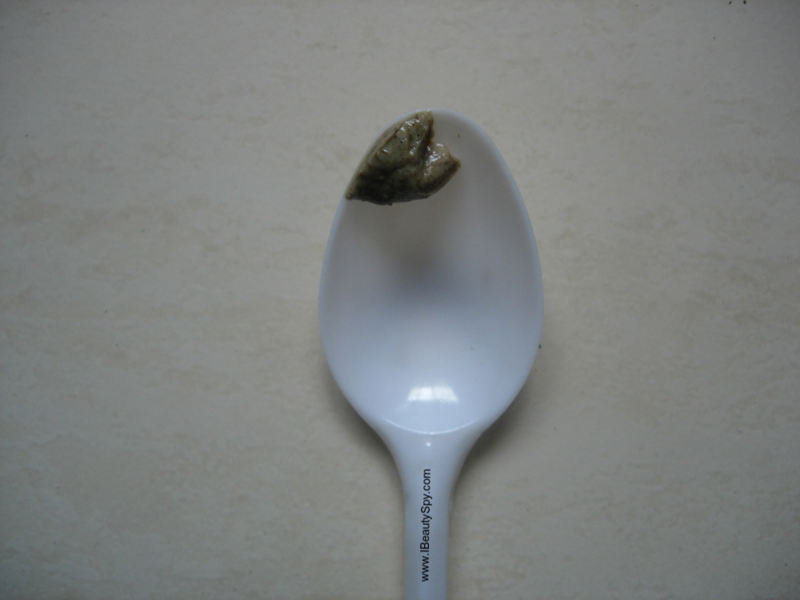 It cleanses, purifies, removes toxins and clears clogged pores absolutely like nobody’s job. The particles feels little abrasive on the skin. So I apply only little pressure while massaging. After washing off, my skin feels super smooth and soft like as if I got an expensive body polishing done at a spa. I apply an after bath oil to moisturize and keep my skin soft and supple. You can see the ingredients – lemongrass, eucalyptus, peppermint, vetiver, cardamom, margosa, amla – all of which are ayurvedic herbs for detoxifying the skin. I am in total love with ingredients list. This is the first time am seeing a body scrub with such a marvellous ayurvedic herbs list. The scent is really calming and relaxing to the senses and I feel like am in a forest. You need only a small amount of the scrub for each use. So one tub is going to last you for a long time. I have been using this for almost 4 months now. And I still have quarter tub left. The price may seem a bit high. But you get a huge tub of 225g. And I feel price is similar to The Body Shop which is nothing but artificial, fruity scents. We can pay the same price for a luxury ayurveda product with so many good ingredients for skin. * Amazing scent of ayurvedic herbs and essential oils which make you feel like you have stepped into a forest. * Deep cleanses and purifies skin. * Detoxifies skin and removes all toxins. * Makes skin super smooth and soft like you have got a spa treatment done. * Only small quantity needed each time. * Free from parabens, SLS. * Packaging can be improved to give luxury feel to the product. Its pricey. But only small quantity needed each time. One tub will last more than 4 months. So what more I need to say! If you wish to have a spa-like experience at home with a luxury ayurveda product, then you can invest in this. The forest scent, the ingredients, the results – nothing will disappoint you. 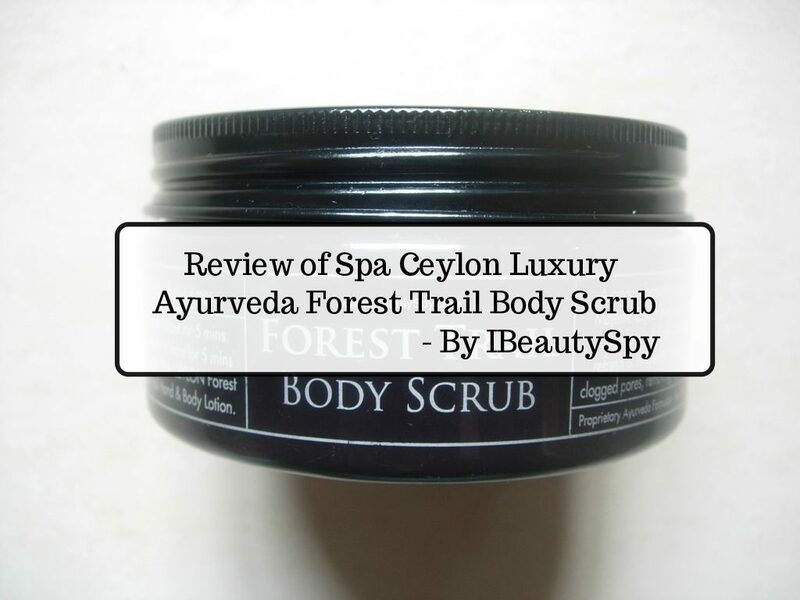 I would highly recommend Spa Ceylon Luxury Ayurveda Forest Trail Body Scrub.